We are living through a boom era for Italian regional cuisine, all around the world. No longer do New York, London, Paris and Hong Kong offer a plethora of merely "Italian" restaurants; today, a regional identification is a major attention-grabber. This regional focus, you could argue, was spawned 25 years ago by the explosion of wall-to-wall putatively Tuscan restaurants... but, today, you can find restaurants all over the globe with the regional traditions of Emilia-Romagna, Sicily, Rome, the Veneto, Lombardy and more, in the forefront. 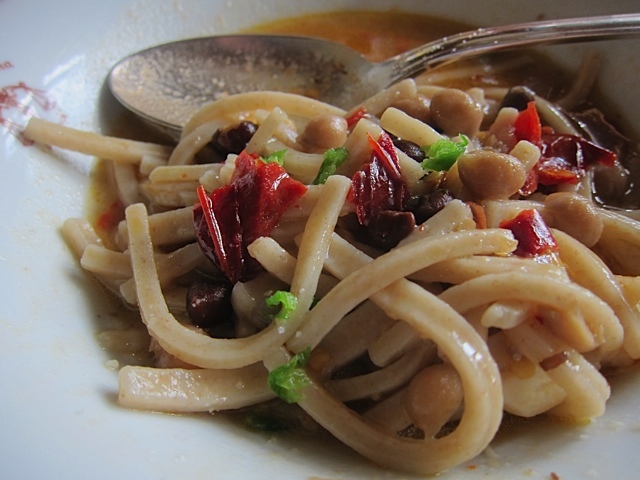 Is the great regional cuisine of Abruzzo on that international list? 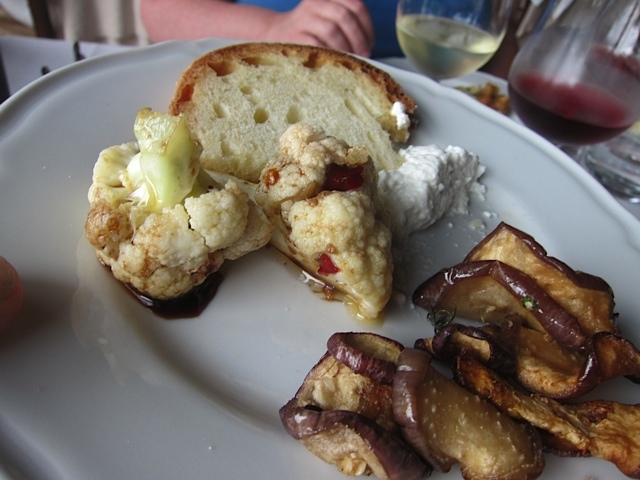 The historic cuisine from the central swath of Italy's Adriatic coast, on the east side of the boot? No. Decidedly no. But that doesn't stop in-the-know foodies who have been there from raving about Abruzzese cuisine. The problem sets in when they try to describe it to others. And that, I would wager, is why "Casa Abruzzese" is not coming to a corner near you anytime soon. Excellent! 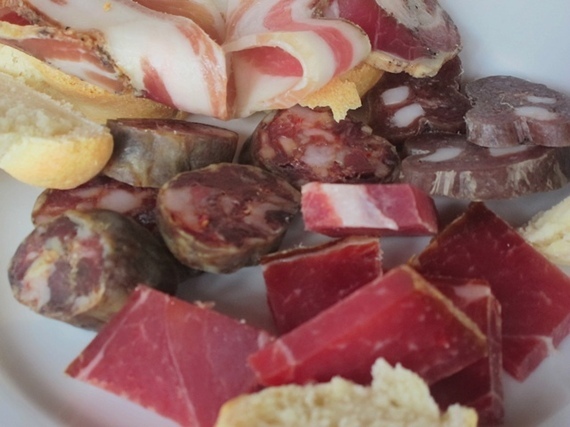 That means that when you travel to Abruzzo, you'll not only be steeped in this ineffable delight... but you won't have to fight off a lot of other tourists researching their new favorite cuisine! 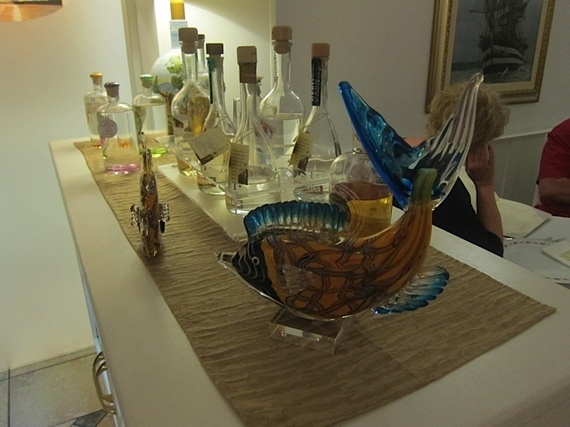 "There's something about Abruzzo," says Nancy Harmon Jenkins, venerable American food writer, who maintains a part-time residence a few hours northwest in Tuscany. "Eating in Abruzzo today reminds me of the Italy I knew when I first came here, in the 1950s, " she told me recently. There is no informing flavor, no take-away taste -- like wild fennel pollen in Tuscany, or pesto in Liguria, or volcanic tomatoes in Naples. But there is in Abruzzo the aura of agriculture about it all, local agriculture determining what the people eat. 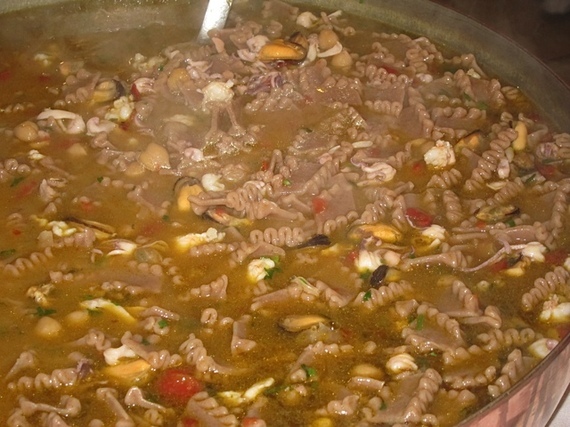 This gives the Abruzzese food a unique purity. 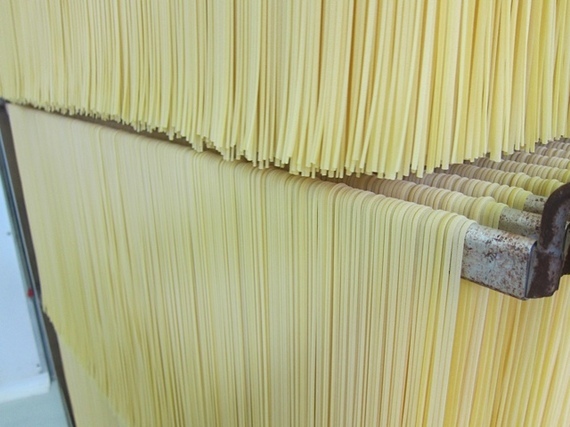 "Part of the fuzziness," says Roland Beramendi, the San Francisco-based importer of Rustichella d'Abruzzo, Abruzzo's most celebrated pasta manufacturer, "comes from the different locales of Abruzzese food." It is often said that the food of Abruzzo, like the food of neighboring Le Marche, has a mountainous side (from the central Apennine part of the region), and a coastal side (from the beaches to the east). "In reality," Beramendi points out, "it's even more complicated. 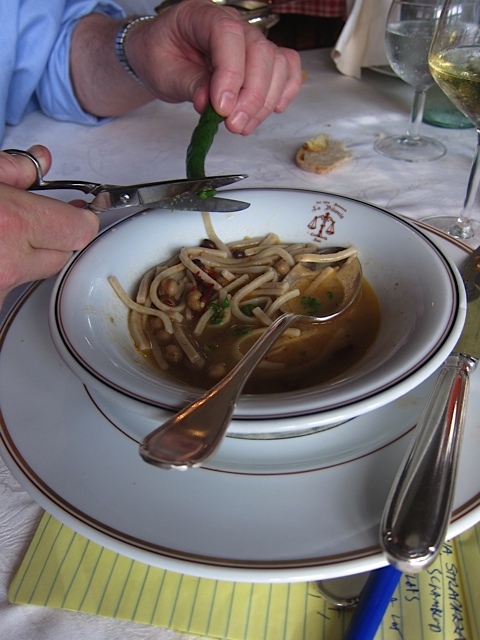 The hill towns in-between mountain and sea actually have a third cuisine, a cuisine of their own. 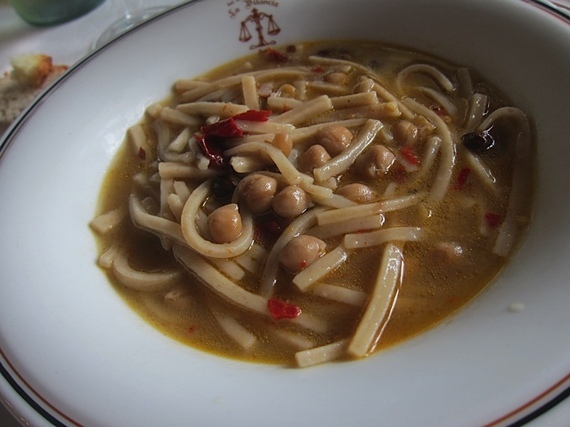 There are three Abruzzese cuisines." Let's start with the mountains; on a recent trip to Abruzzo, I got the feeling that the mountains, in a kind of trickle-down effect, inform all: the mountain austerity, the poverty, the raw agriculture, the paucity of gimmicks, roll through Abruzzese food everywhere. 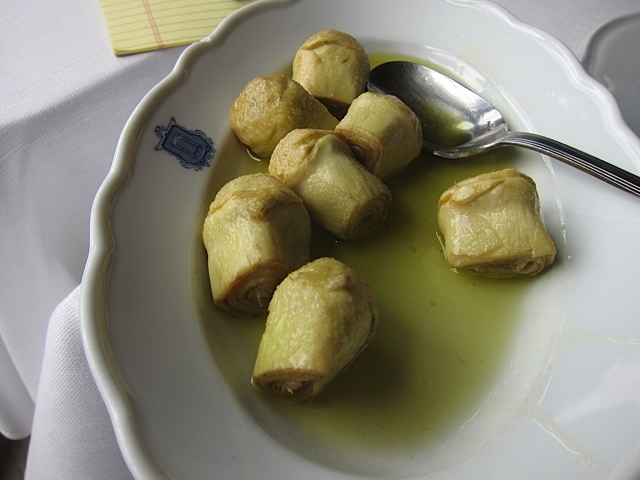 I asked Nancy Harmon Jenkins what she would expect to find if she saw a dish in Rome described as "alla Abruzzese." She answered quickly: "Lamb. The mountains are loaded with lambs and sheep, and nothing says 'Abruzzese' more than a lamb ragu, or a plate of grilled lamb." Up in the mountains, however, there is nothing elegant or "rich" about the lamb preparations. 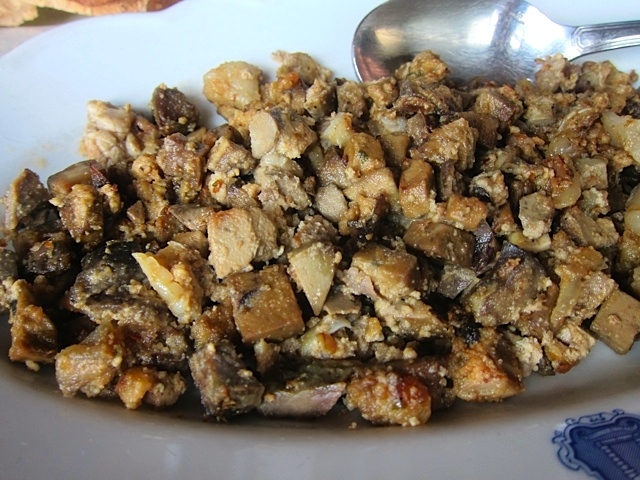 A favorite local dish is coretello -- a rough mince of lamb and lamb innards, usually cooked "dry," without a tomato sauce. It is earthy to the max, like good mountain food should be. Another Abruzzese lamb specialty is arrosticini: small lamb chunks alternated on skewers with small chunks of lamb fat, cooked over a wood fire. 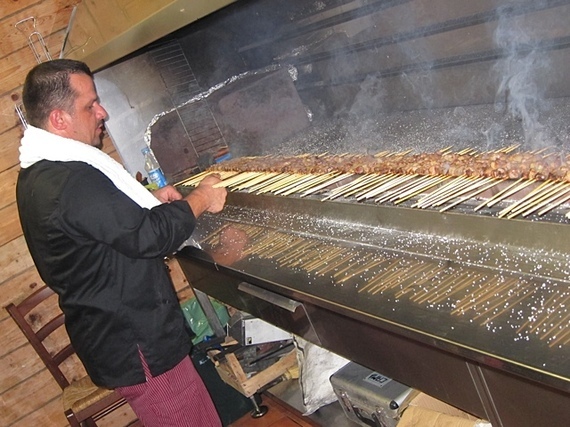 They are made at home, but they are also a feature of special restaurants devoted to them... with appropriately long grills to accommodate the skewers. The chunks of lamb are lightly marinated with herbs, and served medium-well but impossibly juicy. 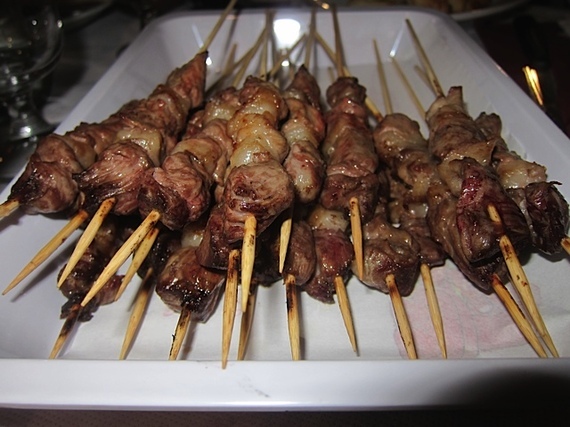 Diners eat them with abandon -- two dozen a person is not unusual -- by sliding the skewers through the teeth so that one piece of lamb and one piece of fat drop into the mouth. Along with such hearty food, you'll find a plethora of la cocina povera complements. Bitter mountain greens. Pickled vegetables. Cheese, made of course from sheep. And coarse versions of salumi, often sliced ruggedly... which is to say unusually thick. But the best is yet to come. For when you roll down the high slopes to the middle hill terrain, you find one of Abruzzo's greatest gems: pasta. 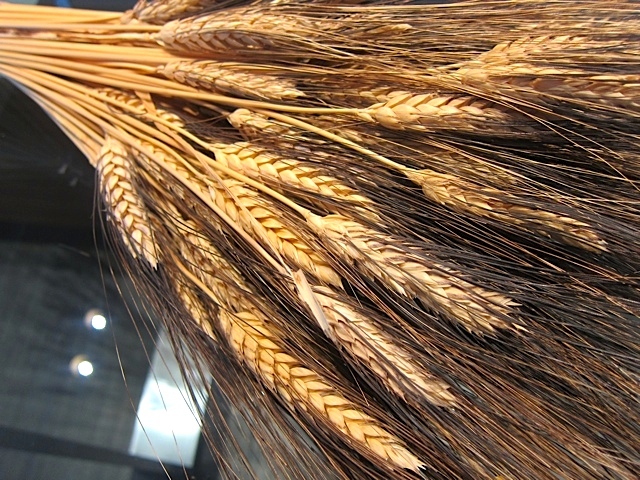 Abruzzese pasta is consumed all over the region, of course (and the world) -- but in the valleys and plateaus of the middle turf, some of Italy's finest hard durum wheat, or semolina, is grown. It makes sense. This is firm, nutty stuff, once again confirming the Abruzzese penchant for the rugged. Most of the pasta they eat is dried pasta, made from semolina and water, brownish and grain-flavored, right out of the box. 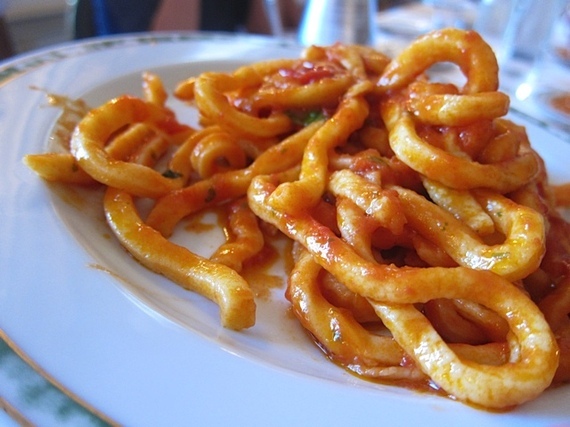 Of course, there is one outstanding exception to the dried-pasta rule...so outstanding that, along with lamb, it helps to define Abruzzese cuisine. Centuries ago, some creative chef decided to pass a sheet of fresh pasta through the strings of a stringed instrument, probably some type of lute brought by Arabic invaders. History does not record whether it was semolina or not, nor does it record whether the pasta contained eggs. Today, however, spaghetti alla chitarra -- spaghetti from the guitar(! 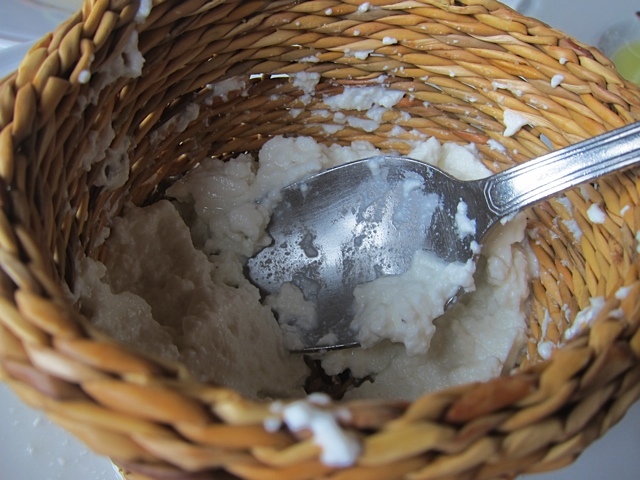 ), usually made with semolina, sometimes made with eggs, often served fresh -- is a major specialty of the region. It can be made elsewhere, but Italophiles always associate it with Abruzzo. 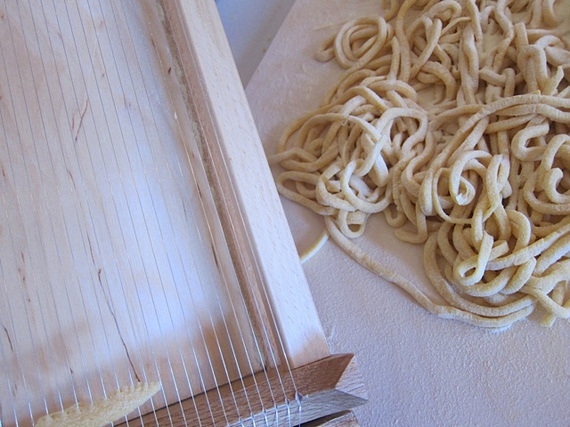 Just-made spaghetti (with semolina and whole eggs) passed through "the guitar"
This is no delicate fettuccine; when made correctly, the strands of long pasta are squared off, and have a firm, lusty chew--perfectly in keeping with the rest of Abruzzese cuisine. Local chefs like to show off this pasta's texture by eschewing the usual lamb ragus, and saucing spaghetti alla cithara instead with simple tomato sauces. Finally, there is the sea -- which, despite yielding the lightness of fresh fish, also yields some characteristically hearty ideas for seafood. You can dine on Abruzzese seafood, surrounded by elegance, in one of the coastal resort towns, or even up in the middle hills -- as I did recently at Carmine, near Loreto Aprutino, one of Abruzzo's most upscale seafood settings. 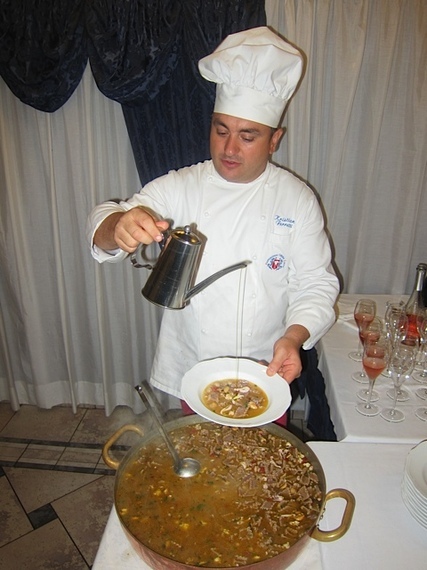 And despite the delicacy of some of Carmine's cooking, his real show-stopper is a lusty, soupy combo of pizzichi di farro -- pasta made from farro, an ancient wheat -- with calamari, sepia, mussels, clams and scampi. However, lovely as Carmine's is -- if you're in Abruzzo to research traditions, you're going to have to make it down to the sea to a surprisingly rustic structure called a traboccho. Set on the Chieto coast, between Francavilla and Vasto, these old wooden structures (made from washed-in acacia trees) exist for the purpose of fishing, with their Rube Goldbergesque nets and poles configured to do the job. Some occasionally serve food... and if you find one, you may be treated to such typical tourist fare as fried fish. But if you're really lucky, and if your traboccho is turning out seafood for the locals... you may actually end up with a bowl of something as infernally, iconically Abruzzese as monkfish tripe. 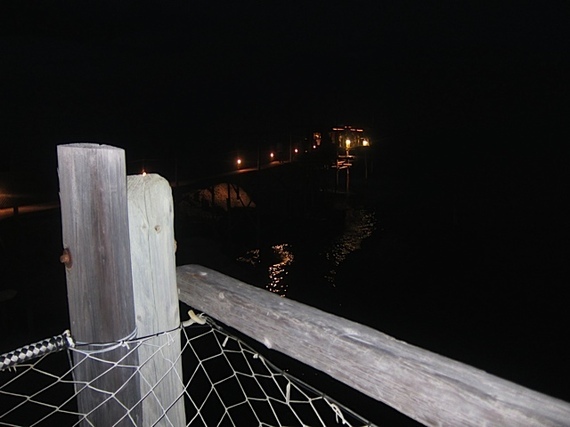 It's wild in them thar hills... but it's wild down by the coast, too.